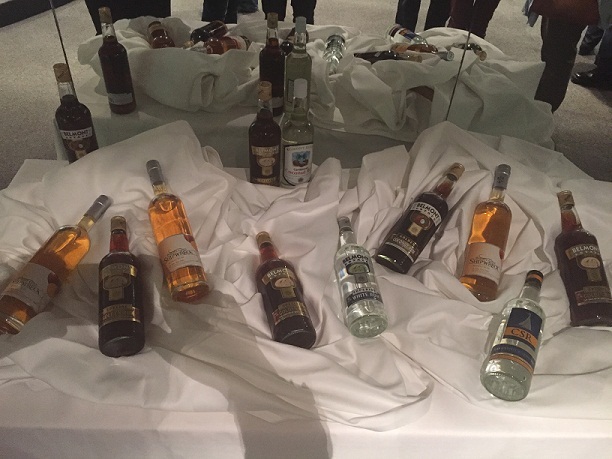 Sheer luck meant I was checking my Twitter feed just as the Telegraph tweeted about a free rum tasting it was hosting in partnership with the St Kitts tourism office promotional trip to the UK. They had 30 pairs of tickets to give away so I hurriedly filled in the online form to register. An hour or so later, I was a confirmed attendee. On a Friday evening we made our way to the Telegraph Media offices in Victoria, where, it has to be said, the organisation from both the St Kitts and Telegraph representatives was slick, with someone to welcome and direct at every corner. Everyone assembled in a side room, with a table full of a fairly potent rum punch to drink and waiters bringing round Kittian food samples such as deep fried spinach fritters (like pholourie), marinated chicken skewers, curry goat and sweet potato, spiced fish and fried plantain. So far, I was liking St Kitts and Nevis. We were then ushered through to the main room for the event. It overlooked the news room which was quite cool, but everyone’s attention was more taken by the tables of rum bottles, showcasing what we’d be drinking that night. Island staples Belmont Estate and CSR whites, alongside the newomer Brinley Gold and its flavoured offerings (lime, mango, spiced and vanilla). Over on another table a golden coconut caught my eye as this is a rare combination, but it seems we weren’t going to be tasting that given its absence from the tasting tables. An introduction from the repsective tourism officers from St Kitts and Nevis and the St Kitts & Nevis tourism minister set the scene: forget everything you know about the Caribbean, St Kitts & Nevis is a destination with so much to offer, but sadly overlooked in favour of its more popular neighbours. I learnt some things too: the distance between the two islands is only 2 miles, there’s an annual swimming race between the two and Admiral Nelson was married to a Nevisian. A presentation on the history of the nations and its rum followed, by rum ambassador Ian Burrell, with hints to remember certain facts. Random quiz questions were indeed thrown in with winners given a bottle from the special table. Then a biggie, the tourist office was giving away two seven-night hotel stays for answers to the next questions. Respect to the first winner for knowing rum was nicknamed Nelson’s Blood by the navy and I had a sneaking suspicion the next question would play to my strength of world capitals. A three-way tie for knowing Basseterre meant the second prize would go to the one who knew any line from the St Kitts & Nevis national anthem. Unbelievably, one of us knew it with ‘land of beauty’. I was going to plump for ‘St Kitts and Nevis’ but for knowing that, the guy deserved it. 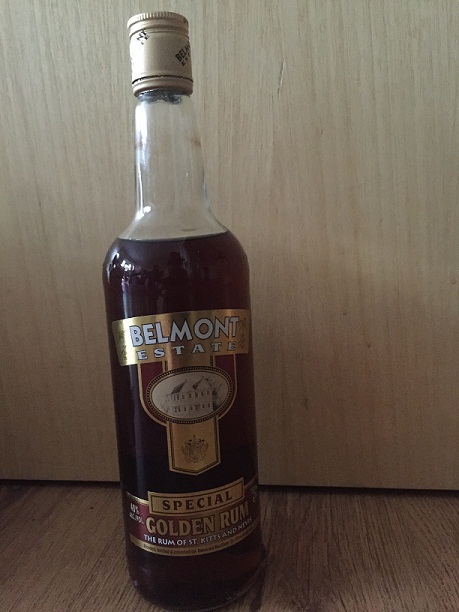 I got a bottle of Belmont Estate dark rum anyway, which also meant I didn’t have to shell out on flights (not included in the prize)! Then it was the main event of the tasting. 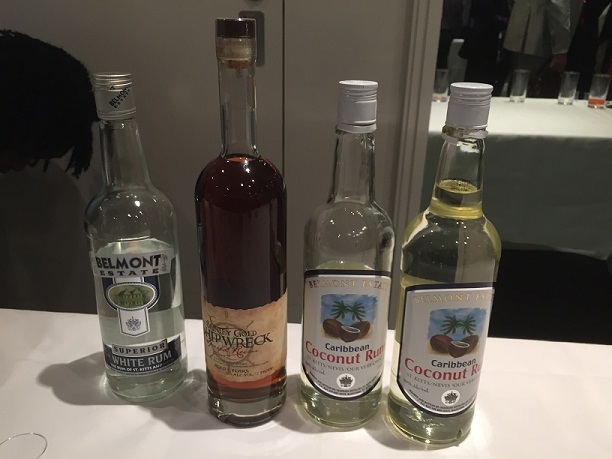 We tasted a basic white rum (Belmont Estate), the perhaps overly sweet Brinley Gold vanilla, Brinley Gold four-year spiced and Belmont Estate coconut (at 30% abv not strictly speaking rum, but a nice drink nonetheless) en masse, but then could go back for the others as we wished. I was really impressed with how laid back it was. 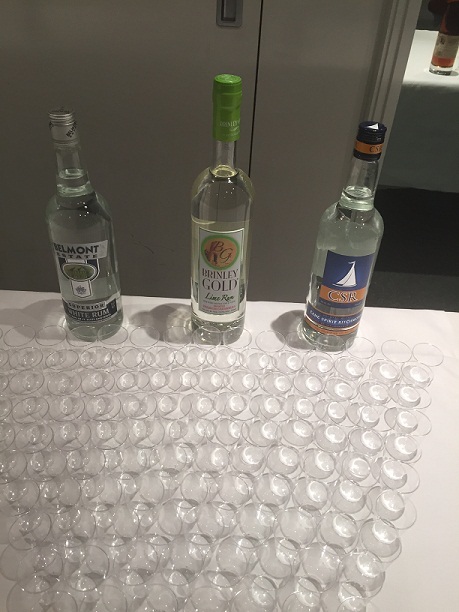 Tourism representatives were available to answer questions about trips, conversation with other couples flowed and we got free tickets to the rum tasting world record attempt. Chatting with Ian Burrell about Mauritian rums meant we were also the last to leave, but still managed to get a goodie bag from the tourist office which, alongside the usual promotional leaflets, included a miniature rum – we got Belmont Estate white and Brinley Gold mango – and a guava jelly and tamarind jam from Nevis. For me, one big question remained outstanding. There are currently no working distilleries on the islands and it was never explained where the rum was now coming from – whether St Kitts & Nevis sugar cane is distilled and bottled elsewhere, whether the ingredients have no St Kitts & Nevis provenance at all anymore, or whether it’s all owned and amalgamated into a global drinks giant’s operations. For a real SKN rum, though, I believe we’re supposed to ask for the ‘Beres’, the under-the-counter local rumfire!